Ben Enwonwu’s iconic painting of princess Adetutu Ademiluyi of Ife, known as “Tutu” has been discovered after being lost for decades. 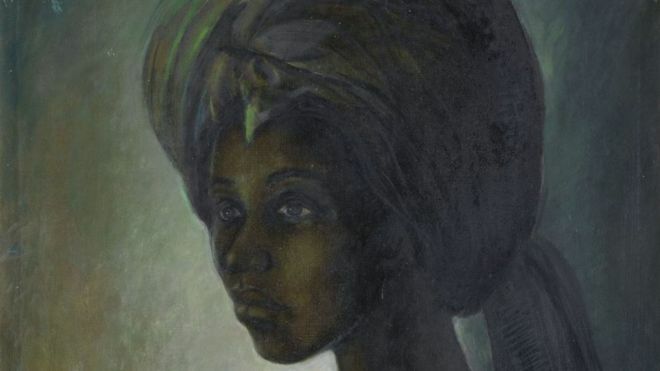 According to a BBC Africa report, the painting was found in a flat in North London on Tuesday. The painter had met the princess three years after the civil war and asked to paint portraits of her. After creating three versions of the portrait and debuting them at Lagos in 1974, they were regarded as national symbols of reconciliation between the regions. Although Ben Enwonwu is regarded as the father of modern art in Nigeria, the Tutu paintings are recognized as his most acclaimed work. They were last displayed at his burial in 1994 before mysteriously vanishing from public eyes till it was recovered in London. Though the two other versions are still missing, print versions have been in circulation since the 70s. Giles Peppiatt, the director of modern African art at London auction house, Bonhams estimates that he is invited to value a version every eight weeks, but they have always turned out to be printouts. In an interview with Reuters, he said this discovery is extraordinary because it’s the first authentic version of the painting he has seen, and it’s in high demand. “It was his greatest masterpiece and people have been asking ‘where is Tutu?’” he said. Nigerian novelist, Ben Okri described the rediscovery as the most significant in contemporary African art in over 50 years. Speaking to The Guardian, he declared that he believes this discovery has the potential to transform the modern art world. This original Tutu will be auctioned on the 28th of this month at Bonhams in London, but will be screened live at Wheatbaker hotel in Ikoyi. Giles estimates the painting will sell for 300,000 GBP.